Seattle, WA – As of this week, 99.9 KISW, “The Rock of Seattle,” in partnership with Elysian Brewing, has donated $300,000 to Puget Sound Fisher House and Joint Base Lewis-McChord (JBLM) Fisher Houses to honor and assist our veterans and active military personnel. 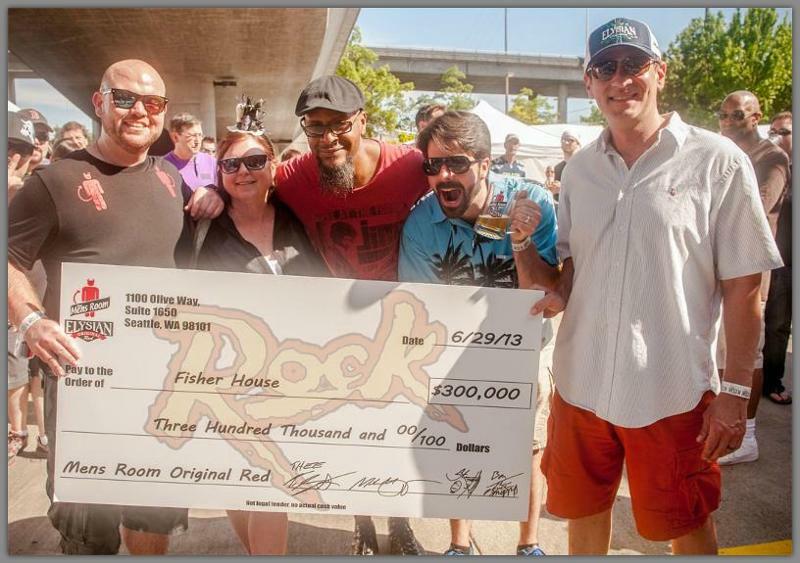 Thanks to the support of the KISW listeners, known as Rockaholics, and beer drinkers in Western Washington, the donations to Fisher House since 2009 now total $300,000. “We consider it an honor to give back to the men and women who have given so much for this country. The fact that we could do that through beer is an added bonus,” says Miles Montgomery, host of The Mens Room. “It’s obvious, it’s necessary, and it’s our privilege. The Fisher House is an unsung hero,” adds Mens Room host, Steve “The Thrill” Hill. In 2009, the iconic and #1 afternoon show, The Mens Room, aired from 2-6pm on KISW, partnered with Elysian Brewing to create Mens Room Original Red. The beer was an instant hit. Its tremendous success allowed KISW and Elysian Brewing to give something back to the community, and a partnership with Puget Sound and JBLM Fisher Houses began. Since opening in 2008, the VA Puget Sound Fisher House has served over 3,600 families of veterans and active-duty military personnel. Among other services, The Fisher House provides temporary housing to families of veterans and active service personnel while service members are being treated at the VA Puget Sound Health Care System. The organization recognizes the special sacrifices of our men and women in uniform and the hardships of military service by meeting a humanitarian need beyond that normally provided by the Department of Veterans Affairs.